The biggest problem with relying on referrals to grow your business is the lack of control. At least the way most studio owners use referral marketing. Referrals are typically passive leads that come to you only when a client remembers to tell their friend about you or when they happen to mention you to someone they know. A few studio owners are actively seeking out referrals in their business, usually at the point of sale. The trouble with this approach is you’re relying on one opportunity to get referrals and not maximizing the value of your new client to your business. What if half your current clients sent you 1 good referral? That would drastically impact your business. You’d have more clients, make more money and be able to explore new opportunities for growth. Now, imagine if every client you worked with referred 1 new client to you per year! That would lead to rapid growth for your business. A 100% referral rate may be out of reach for most, but if you put these steps into play to get more referrals you’ll start to transition referral marketing from a passive to proactive strategy. Controlling the way you get referrals and actively putting promotions and activities in place to get more referrals is the key to seeing massive growth in your business. The best at getting referrals are working to build relationships and setting the stage for getting referrals with their clients at all times. Luckily, there are a few things you can do in your business to build a foundation for a great referral program. They don’t take a lot of work, but they do require discipline and consistency if you want them to work. It’s a lot like getting results in the gym. It’s not challenging to get great results if you show up, do the work and repeat that process consistently. Put this plan to work for you and in 90 days or less you’ll notice a surge in referrals in your business. It’s important not to skip any of the steps. This is the foundation you need for a great referral marketing program in your business. The foundation of your referral system is based on rewarding and recognizing the behavior that you want your clients to repeat. There’s no one perfect way to create your rewards system, but the most common is giving your clients $50 cash or a $50 gift card for each referral that they send you. Instead of discounting your client’s membership or giving them freebies (which they are already happily paying for) you can get a lot more from offering up a reward. The magic isn’t in the amount of the reward but in the fact that you took the time to give your client something to thank them and recognize them for referring a friend. You can start with a $20, $25, $50 or $100 reward. Consider it a marketing investment for your business. If you know the lifetime value of a client to your business it’s easy to figure out how much you should be willing to invest to get a new client. Let’s say an average client stays with you for 6 months and pays $200/mo. The average client lifetime value with you is $1,200. Would you invest $100 to get $1,200 back? Of course. There’s power in being able to hand your clients something physical, like cash or a gift card. Donating the reward to the organization or charity of your client’s choice is a great way to give back while still providing them with a reward. Make the donation in their name and make sure you have proof of the donation so you can show it to them. The proof of the donation or total amount for the month is a great marketing resource as well. If a client refuses the reward it’s a great idea to take the budgeted amount and send them a personalized gift to their home or office. Make sure to try and get a coworker or the delivery person to take photos for you to use later. Client’s don’t always know how to refer someone to your business. What program is best for them? What do they tell their friends about the price? Make it easy for your clients to refer business to you by providing them with a streamlined process to both send referrals to you and to provide you with referrals. Create a branded form that they can fill out to provide you with the contact of the person they would like to refer, and make it readily available at all times. Set up an online form to allow them to send you referrals when it’s most convenient for them. Create gift cards or marketing materials that the client can give to their friends if they ask about your programs. Typically this will have a special Front End Offer on it. You want your clients to have an elevator pitch ready for when they need it. If someone asks them about your business, and maybe even if they should try it, you want them to know what to say. This doesn’t mean training your clients to deliver a 15-second pitch to everyone they meet. The better way to educate your clients is to consistently remind them of what you do, why you do it and the reasons you’re the best solution for them. Using your positioning statement and differentiators as a guide, make sure you deliver content that educates your clients on your business. When your clients feel comfortable explaining what you do and why you do it to their friends they will be more likely to talk about it. Pair that with their incredible results and experience in your studio, and you’ve got a winning combination for referrals. You need to keep your referral program in front of your clients all the time. It doesn’t have to be an in your face request for referrals, but they should be aware of the program and constantly reminded that you love getting referrals. This all starts with setting the expectation early in your relationship with the client. Immediately after joining your program you want to clearly explain the referral program and set the foundation for each client referring you a friend or family member. Some clients will be excited and want to refer friends to you right away and others will need to make sure you deliver on your promises before referring. Either way you want to set the expectation that the biggest compliment you can get from a client is a referral. It means that they trust you enough to recommend you to their friends and family. “Mrs. Jones, we’re really excited to get you started on your program, and I look forward to helping you get rid of those unwanted pounds before summer gets here. One of the expectations we have from clients, as long as they love their experience with us and we help them reach their goals is that they refer a friend or family member to us at least once per year. Referrals are the best marketing that I can do for my business, and it’s the biggest compliment you can give us. As a thank you for referring someone we give our clients $50 cash for each referral they send us. It’s our way of saying thank you. If you know of anyone right now here’s a form with space for the contact info of the people you think may be a good fit for us. We’ll be happy to reach out to each of your friends with a special offer to join our program as your special guest and we promise to take amazing care of them. Promoting your referral system doesn’t end at the point of sale and your follow-up system. It’s also important that you create opportunities to recognize those that refer, and use that opportunity to remind your other clients about the rewards they get if they refer. Take a picture with the client that referred the friend handing them their reward (it’s even better if you can take this with the client and the person they referred). Recognize and thank the client that referred in your sessions in front of the other clients. Each week in your newsletter welcome your new clients and thank the clients that referred. Include pictures if you are able. Post the pictures of you handing out rewards on social media, and do a call out/thank you to the client by tagging them. Post the pictures or create certificates for referrals in your studio. Ensuring that you recognize clients in several places allows you to keep your referral program in front of your clients. A few times a year you want to create a little extra buzz around referrals by running dedicated promotions to incentivize your clients to refer. The most commonly used are the Bring A Friend Week/Month and Referral Contests. These tend to work well when placed in slower marketing times like the summer, when you can leverage the relationship you have with your clients to see a surge in new leads. Rotating these two promotions throughout the year allows you to build them up and create excitement through your marketing without overusing them and burning your clients out on them. Approach these promotions with the same marketing intensity you would a challenge. Awareness is key to making these a success and your clients need a little time to think about and organize getting friends and referrals to come in with them. Typically you’ll add something to your regular rewards program for these contests or Bring A Friend periods such as prizes, doubling the reward or other incentives. Throughout the duration of the promotion it’s important to continue to market and spread awareness. Once you’ve mastered the basics and implemented the 5 steps above to get more referrals for your business it’s time to explore the missed referral opportunities. Every time a client hits a goal or reaches a progress milestone write them a personal note congratulating them and reminding them that the best way to thank you and compliment you is to refer friends. Every quarter schedule a personal touch point (call, meeting, handwritten note) with each client in which you thank them, recognize them and ask for a referral. Train your team to listen for clients saying, “My friend/sister/coworker was asking about what I do for workouts and I told them about you.” If a client mentions a possible referral teach your team to take advantage of that opportunity by getting the name so they can contact them or provide the client with an easy way to refer. Collect testimonials from clients on a regular basis (these are just as good as referrals) and publish their story on social media tagging the client. 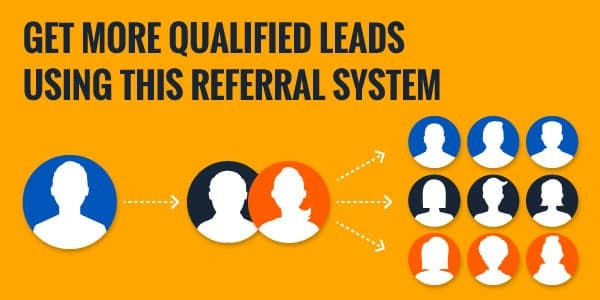 If your #1 source of leads right now is referrals, adding in this referral system and putting the 5 steps we’ve covered here in place will only amplify your marketing and business growth. Set a target and create the mindset that every client should refer you at least one person per year. It’s time to start proactively getting referrals! 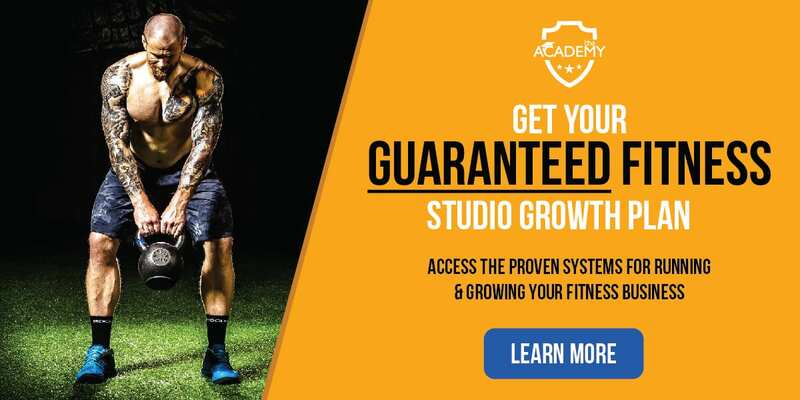 The Academy is the top resource for personal trainers looking to take their business to the next level. From marketing strategies to help you attract more clients to our proven sales system to close 50% more sales in your business, everything is at your fingertips when you join this exclusive group of fitness business owners. This is a great article. I got plenty of outstanding ideas on how to start an effective referral program.